I had the luck of visiting the Amerigo Vespucci, a tall ship of the Italian Marina Militare, named after the explorer of the same name. When I saw pictures of this ship I thought it was made of wood, so imagine my surprise when I saw it's made of riveted steel plates. It seems caught between two eras, the looks of an 18th century wooden ship, and the technology and materials of the 1920's (with small upgrades for the 21st century). Click on the pictures to see in more detail. In 1925, the Regia Marina ordered two school ships to a design by General Lieutenant Francesco Rotundi of the Italian Navy Engineering Corps, inspired by the style of large late 18th century 74-cannon ships. The first, the Cristoforo Colombo, was put into service in 1928 and was used by the Italian Navy until 1943. After World War II, this ship was handed over to the USSR as part of the war reparations and was shortly afterwards decommissioned. The second ship was the Amerigo Vespucci. It was built in 1930 at the Regio Cantiere Navale of Castellammare di Stabia, near Naples, where it was launched on February 22, 1931, on the 50th anniversary of the naval academy’s foundation. It is still in use as a school ship. The ship also carries out the role of ambassador for culture and Italian naval tradition, as it takes part in several important activities and events all over the world. 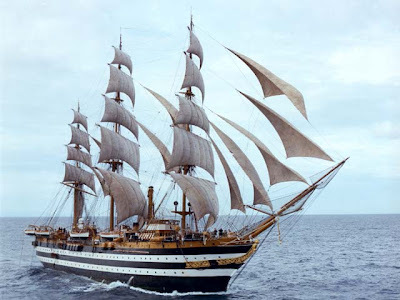 The vessel is a 101m long steel hull sailing ship with engine and three vertical steel masts. The hull is painted black with two white stripes in reference to the two gun decks of the original ships the design is based on. All the sails are traditional canvas sails, and all the ropes of the rig are traditional hemp ropes; only the mooring lines are synthetic, to comply with port regulations. Originally it had 2-stroke 6-cylinder FIAT Q 426 engines, but in 1964 these were replaced with two 4-stroke, 8-cylinder FIAT B 308 ESS diesel engines. The newer engines generate electric power for one electric propulsion motor. Its motto is 'Not those who begin but those who persevere', a sentence attributed to Leonardo Da Vinci. It's made of riveted steel plates after all! Incredible pictures, thank you for sharing!